Today we are going to look at solar fence chargers. If you need to install an electric fence, the solar charger is one of the best ways of providing power. However, choosing which one to buy can be difficult. There’s a range of options available covering the needs of every landowner. Whether you have a small garden and wish to keep pets away, or a series of fields containing livestock, there’s a suitable solar charger available. In this review round up we have selected 5 top rated models to give you the low down on each. For our findings at a glance, head to the table below. For in depth reviews plus a dedicated buyer’s guide, keep on reading. Solar fence chargers can be rated according to their energy output, quality, impedance level, design quality, cost-performance ratio, and fence length that it can effectively power. Using this rating criteria, 5 of the best solar fence chargers have been selected for review. Let’s take a look. Our top pick product is this low-impedance, battery-operated solar-powered fence charger from Parmak. It features solid state circuitry and comes with a powerful solar panel as well as a built-in analog performance meter that allows one to monitor the state of fence electrification. It is powered by a 6-volt battery that comes along with this product. This fence charger can generate up-to 1.6 joules of power; and a fence voltage of 9000 volts in an open circuit fence design or about 2650 volts in a closed-circuit open fence design whose electric wires have a combined resistance value of 500 ohms. The DF-SP-LI Solar-Pak 6 is a compactly-designed, lightweight, and portable fence charger. It is 15 inches long and 9 inches thick, while its height is 18 inches. This model is laser-trimmed and its weatherproof casing makes it suitable for outdoor installation. Its large gray-colored casing features an attached red-colored cover whose bottom-side has two ports for power output and an on-off switch on its front side. The solar panel is attached on top of the gray-colored casing, and the weatherproof design of the panel allows it to endure environmental insults as well as extremes of weather. This model weighs about 17.2 pounds, which makes it quite portable, and the user can install it on any pole in the fence system. This model is designed to capture solar energy and transduce (or convert) it efficiently into electric power that is then transmitted through the electric wires of the fence. This energy-design model allows this solar fencer charger to exploit free and renewable solar energy to maximize the shock that flows the wires. The solar panel of the DF-SP-LI Solar-Pak 6 features a state-of-the-art design that gives it an exceptional battery charging power, estimated to be 142 percent of the battery capacity of the 6-volt battery. This battery is a heavy-duty, long-lasting store of electrical energy that can power the fence for 21-days if there is no sunlight. Furthermore, the powerful solar panel can charge the battery during a cloudy day as the solar cells in the panel are quite sensitive and can convert even weak ultra-violet rays into electric power. This model can generate large currents and voltages, and this attests to power and ingenuity of the design of its internal circuitry which allows low power input to generate a greatly amplified power output. This is due to its solid-state circuitry whose design is laser-trimmed for precision. This circuitry generates pulses of medium amperage shocks for a medium-time duration; and this makes it suitable for controlling short-haired livestock and pets, especially in areas where the vegetation cover is light. Another important aspect of this circuitry is its impedance which is quite low, hence allowing this charger to effectively power a fence system whose electric wires are in contact with vegetation. For convenience purposes, the inbuilt analog performance monitor allows the user to check on the status of electrification of the fence. The Deluxe Field Solar-Pak 6 is built to power a 25-mile long electric fence. The 25-mile length is the total length of an electric wire that can be powered effectively by this charger. This means that if the fence is made up of four electric wires enclosing the pasture, then the total length of all the four wires combined should not exceed 25 miles. Therefore, people who have multiple-wire fences need to add up the total length of all the wires of the fence so as to know if this charger is suitable for them. Regardless, the 25-mile length limit makes this charger suitable for powering a fence system that encloses a small or medium-size pasture. Its power output also makes it suitable for powering a fence designed to keep out farm animals including cattle, dogs, pigs, and horses. Even so, the material of the fence wires is important as they determine the overall electrical resistance of the fence. Normally, steel wires are recommended because they have a low electrical resistance as compared to polywires, tape and ropes. However, aluminum has a lower electrical resistance as compared to steel but an aluminum fence is quite expensive. Regardless, the 25-mile rating for this solar energizer is based on performance achieved on fences with steel wires. This model with a 24 months warranty that is guaranteed by Parker McCrory Manufacturing. A unique aspect of this warranty is that it covers lightening-caused damages. The 6-volt battery that comes with this Solar-Pak 6 model is guaranteed by a 12-month warranty. This product comes in a fully-assembled state, and one only needs to install it to the electric fence system. It is also shipped alongside its easy-to-follow installation and maintenance guide. Fully-assembled system with solar panel and 6-volt long-life solar battery. Can power up-to 25 miles of electric fence. Solid weatherproof construction for outdoor installation. Features an inbuilt performance meter. Can control livestock and pets. Generates up-to 1.8 joules of power. Not suitable for large pastures with total fence length longer than 25-miles. Cannot effectively stop large long-haired animals with thick hides. The Parmak Deluxe Field Solar-Pak 6 is a low-impedance, battery-operated solar-powered fence charger whose solid state circuitry is powered by a high-quality solar panel, and can generate enough electric current to power a 25-mile long electric fence. It comes with a built-in analog performance meter that allows one to monitor the state of fence electrification; while its heavy-duty 6-volts solar battery can store power for long periods. The high energy output, exceptionally low impedance level, design quality, outstanding cost-performance ratio, and ability to power a relatively large fence makes the Parmak Deluxe Field Solar-Pak 6 the best solar fence charger in our top 5 review round up. This is a low-impedance, battery-operated solar-powered fence charger that features solid state circuitry and comes with a powerful solar panel that provides enough containment power to cover a 10-mile long electric fence. It is powered by a 6-volt, 12-amperes battery. This energizer can generate up-to 0.15 joules of power; and a fence voltage of 7500 volts in an open circuit fence design, or 20 percent less in a closed-circuit fence design. This model is designed, built, and tested by Zareba Systems, a U.S-based company. 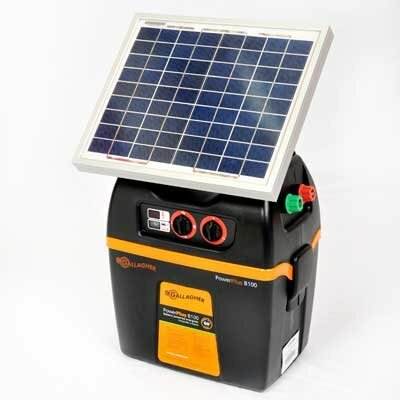 Unlike the Parmak Deluxe Field Solar-Pak 6 whose solar panel is detached from the cabinet of the fence charger, the Zareba ESP10M-Z features a unique integrated design that allows the solar panel and battery to be assembled, alongside the circuitry of the energizer, into a single weatherproof cabinet. This makes the installation process of the ESP10M-Z much easier as compared to that of Parmak. In fact, the Zareba ESP10M-Z is designed for quick installations on round wooden posts, T-posts, and Y-posts. It also features an intuitive integrated mount that allows it to be fitted on flat surfaces, including those found on buildings. The ESP10M-Z is a compactly-designed, lightweight, and portable fence charger. It is 11.5 inches long and 11.2 inches wide, while its thickness is 8 inches. Its weatherproof casing makes it suitable for outdoor installation. The color-scheme of its casing is black with its solar panel attached to the top-facing side of the cabinet. At the bottom-side of the casing are two ports for power output and an on-off switch on its front side. Next to the switch is an indicator light that flashes when the charger is powering the electric fence. This model weighs about 4.2 pounds, which makes it more lightweight than the Solar-Pak 6. This also makes the Zareba ESP10M-Z quite portable, and the user can install it on any pole in the fence system. Just like Parmak the energy-design model of the ESP10M-Z allows it to capture renewable solar energy and transduce it efficiently into electric power that is then transmitted through the electric wires of the fence. This design allows it to maximize the shock that flows through the wires. The solar panel of the unit features a state-of-the-art design that gives it an exceptional battery charging power capable of fully-charging its 6-volt, 12-amperes battery. This battery is a heavy-duty, long-lasting store of electrical energy that can power the fence for 14-days if there is no sunlight so long as it is was full charged beforehand. The Zareba can also generate large currents and voltages, and this attests to power of its internal circuitry which allows low power input to generate a greatly amplified power output. Its circuitry generates medium amperage shocks that are suitable for controlling short-haired livestock and pets, especially in areas where the vegetation cover is light. The ESP10M-Z is built to power a 10-mile long steel-wire electric fence. This 10-mile length limit makes this charger suitable for powering a fence system that encloses a small or medium-size pasture. Furthermore, its power output makes it suitable for powering a fence designed to keep out farm animals including cattle, dogs, pigs, and horses. This model with a 12 months warranty that is guaranteed by Zareba Systems. As expected, this product comes in a fully-assembled state, and one only needs to install it to the electric fence system. It is also shipped alongside its easy-to-follow user guide. Fully-assembled system with solar panel and 6-volt, 12-amperes long-life solar battery. Can power up-to 10 miles of electric fence. Not suitable for large pastures with total fence length longer than 10-miles. The Zareba ESP10M-Z is a low-impedance, battery-operated solar-powered fence charger that features solid state circuitry and comes with a powerful solar panel that provides enough containment power to cover a 10-mile long electric fence. It is powered by a 6-volt, 12-amperes battery that can power an electric fence for 14 days without a need for recharge. This is a low-impedance, battery-operated solar fence controller that features a well-built circuitry and comes with a powerful solar panel that provides enough containment power to cover a 2-mile long electric fence. It is powered by a 4-volt, 0.02 amperes solar battery. It can generate up-to 0.04 joules of power, and a fence voltage of 8000 volts in an open circuit fence design, or 20 percent less in a closed-circuit fence design. This model is designed, built, and tested by Zareba Systems. Like the ESP10M-Z, the Fi-Shock ESP2M-FS features a unique integrated design that allows the solar panel and battery to be assembled, alongside the circuitry of the energizer, into a single weatherproof cabinet. This makes its installation process just as easy as that of the Zareba ESP10M-Z. Likewise, the Fi-Shock is designed for quick installations on round wooden posts, T-posts, and Y-posts. However, unlike the Zareba model reviewed above, the Fi-Shock ESP2M-FS does not feature an intuitive integrated mount for installation on flat surfaces. Overall, this is a compactly-designed, lightweight, and portable fence charger. It is 11.14 inches long and 9.97 inches wide, while its thickness is 6.41 inches. With its weatherproof casing the unit is obviously suitable for outdoor installation. The solar panel is fitted in the top-facing side of the cabinet. At the bottom-side of the casing are two ports for power output and an on-off switch on its front side, just underneath the solar panel. Below the switch is an indicator light that flashes when the charger is powering the electric fence. This model weighs about 3.8 pounds, which makes it more lightweight compared to Zareba reviewed above. The most unique feature of the Fi-Shock ESP2M-FS is the design of its solar panel. Its solar panel has a unique compartmental damage-resistant construction that not only reduces the chances of damage, but also limits the effect of damage, if it occurs, on the capacity of the panel to generate electricity. The solar panel also has an exceptional battery charging power that allows it to fully charge a 4-volt, 0.02-amperes battery. Just like the Zareba ESP10M-Z, the Fi-Shock can generate large currents and voltages, and this attests to the ingenuity of the design of its internal circuitry which allows low power input to generate a greatly amplified power output. Furthermore, the impedance of this circuitry is quite low, hence allowing this charger to effectively power a fence system whose electric wires are in contact with vegetation. The Fi-Shock ESP2M-FS is built to power a 2-mile long steel-wire electric fence. This 2-mile length limit makes this charger suitable for powering a fence system that encloses a small-size pasture. The power output also makes it suitable as a pet deterrent as it can keep out pet animals including dogs, pigs, and cats. The model comes complete with a 12 months warranty that is guaranteed by Zareba Systems. As expected, this product comes in a fully-assembled state, and one only needs to install it to the electric fence system. It is also shipped alongside its easy-to-follow user guide. Fully-assembled system with solar panel and 4-volt, 0.02-amperes solar battery. Can power up-to 2 miles of electric fence. Not suitable for medium-size or large pastures. Cannot effectively keep out ordinary large-bodied short-haired domestic animals such as cattle and horses. The Fi-Shock ESP2M-FS is a low-impedance, battery-operated solar fence controller and pet deterrent. It features well-built circuitry alongside a powerful solar panel that provides enough containment power to cover a 2-mile long electric fence. If you are looking to fence off a small area of land, this unit is one of the best solar charges you can buy. The Gallagher G392SK is a low-impedance, battery-operated, and fully modular solar fence charger kit. It provides enough containment power to cover a 7 mile long electric fence. The unit is powered by a 12-volt battery. This energizer can generate up-to 0.8 joules of power. The model is designed, built, and tested by Gallagher Group Limited through its U.S subsidiary Horizon Distribution. The Gallagher G392SK B100 solar kit is a compactly-designed, lightweight, and portable fence charger that features a robust durable design, with a detached 10-watt solar panel. The solar panel is designed to placed on top of a portable carrying case, which also doubles as the cabinet of the energizer. This cabinet features a carrying-handle for convenience of portability and transportation. The cabinet of this solar kit is 20 inches long and 6 inches thick, while its height is 26 inches. This makes it larger than the Parmak Solar-Pak 6, the other energizer model that features a detached solar panel. This cabinet is well-trimmed and its weatherproof casing makes it suitable for outdoor installation. On the top of the side panel of this casing (cabinet) are two ports for power output, while its front panel features an on-off switch on its top section, alongside 2 regulator dials, with one designed for setting the battery-saving mode of the energizer. The solar panel is attached on top of the casing, and the weatherproof design of the panel allows it to endure environmental insults as well as extremes of weather. This model weighs about 17.6 pounds, which makes it just as portable as the Parmak Deluxe Field Solar-Pak 6.. The energy-design model of the G392SK B100 allows it to capture free solar energy and transduce it efficiently into electric power that is then transmitted through the electric wires of the fence at a fully-optimized shock-level state. Unlike the Parmak or the Zareba and Fi-Shock models, the Gallagher G392SK B100 does not come with a battery, and one needs to separately acquire an 12-volt DC rechargeable battery. Also, a 9-volt dry cell battery can power this energizer, but dry cells are not rechargeable. It is also advisable that they are only acquired as back-up energy sources. The owner should prioritize acquiring a deep-cycle 12-volt marine rechargeable battery which is the rechargeable DC battery that is most compatible with this energizer model. This model comes with an enclosure where the battery is to be fitted. The internal circuitry of the G392SK B100 allows it to generate large currents and voltages from low power input. This circuitry generates medium amperage shocks that are suitable for controlling short-haired livestock and pets. This impedance of this circuitry is quite low, hence allowing this charger to effectively power a fence system whose electric wires are in contact with vegetation. The 7-mile length limit makes this charger suitable for powering a fence system that encloses a 70-acre pasture. The enclosure capacity is rated as 7 miles as the manufacturers consider the fact that a normal fence is a multi-wired fence. Not suitable for large pastures with total fence length longer than 20-miles. Expensive when compared to the Parmak Deluxe Field Solar-Pak 6, (which offers similar specs). The Gallagher G392SK B100 is a low-impedance, battery-operated, and fully modular solar fence charger kit. It covers up to 20-miles of electric fence. Overall a quality solar fence charger that loses out to the competition due to its higher price point. The interestingly named Red-Snapr ESP10M-RS is a low-impedance, battery-operated solar fence controller with containment power to cover a 10-mile long electric fence. It is powered by a 6-volt, 12 amperes solar battery. It can generate up-to 0.15 joules of power, and a fence voltage of 9500 volts in an open circuit fence design, or 20 percent less in a closed-circuit fence design. The model is designed, built, and tested by Zareba Systems. The construction and design features of the Red-Snapr ESP10M-RS are very similar to those of the Fi-Shock. For instance, the ESP10M-RS features an integrated design that allows the solar panel and battery to be assembled, alongside the circuitry of the energizer, into a single weatherproof cabinet. This makes its installation process just as easy as that of Fi-Shock, with the unit being designed for quick installations on round wooden posts, T-posts, and Y-posts. The ESP10M-RS is a compactly-designed, lightweight, and portable fence charger. It is 11.5 inches long and 11.25 inches wide, while its thickness is 8 inches. The solar panel is fitted in the top-facing side of the cabinet. At the bottom-side of the casing are two ports for power output, and an on-off switch on its front side, just underneath the solar panel. Next to this switch is an indicator light that flashes when the charger is powering the electric fence. This model weighs about 4.11 pounds, which also makes it as lightweight and portable as the Fi-Shock reviewed above. The solar panel in Red-Snapr ESP10M-RS has a compartmental damage-resistant construction that not only reduces the chances of damage, but also limits the effect of damage. This panel fits well into its energy-design model. The solar panel also has an exceptional battery charging power that allows it to fully charge a 6-volt, 12-amperes battery. The internal circuitry allows the unit to generate large currents and voltages from low power input. Thus the power output makes it suitable for powering a fence designed to keep out farm animals including cattle, dogs, pigs, and horses. As with the other chargers in our top 5 round up, the impedance of the circuitry is quite low. This allows the charger to effectively power a fence system whose electric wires are in contact with vegetation. The 10-mile length limit makes this charger suitable for powering a fence system that encloses a small- or medium-size pasture. The model with a 12 months warranty that is guaranteed by Zareba Systems. This product comes in a fully-assembled state, and one only needs to install it to the electric fence system. Fully-assembled system with solar panel and 6-volt, 12-amperes solar battery. The Red-Snapr ESP10M-RS is a low-impedance, battery-operated solar fence controller. Featuring a powerful solar panel that provides enough power to cover a 10-mile long electric fence, this is a good option for those with medium sized areas of land requiring containment. What is a solar fence charger? 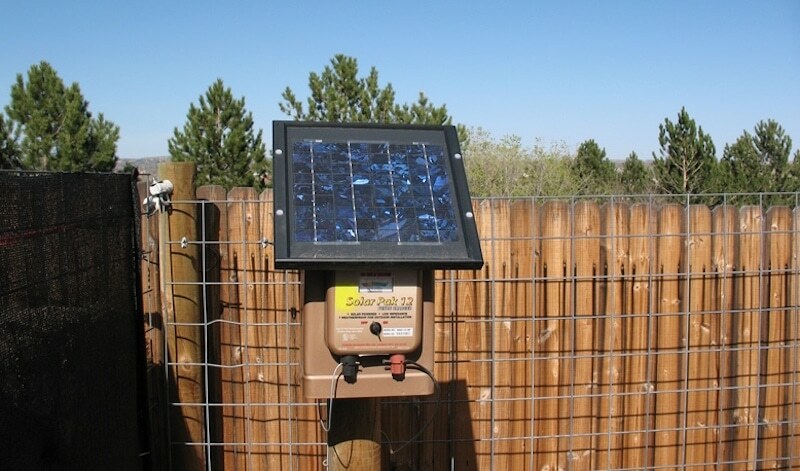 A solar fence charger is the key component in a solar-powered electric fence system. It is also called a solar energizer or solar fencer, and it belongs to one of the three main categories of fence chargers. Solar fence chargers are rated based on their level of current output. This current is transmitted through a series of electric wires that form a grounded closed circuit. This means that the fence system is grounded and its wire and fencer form a complete circuit. This ensures that there is current always flowing through the uninsulated wires as long as the fencer is working, and these live wires can give an electric shock to any animal, person, or bird that comes in contact with it. The amount of current flowing through the fencer system determines the degree of charge given. This can range from simple non-lethal shock to (potentially) fatal electrocution. This way, the electric fence serves as a deterrent or barriers against encroachment by animals or people into a fenced-off area. AC powered fencers 110-volts or 220-volts of AC power, and they can power 200 miles of electric fence wire; and this makes it suitable for permanent fence systems. However, some farms are located in areas where linking up to the grid is difficult. In other words installing an AC-powered fence system isn’t practical. Even so, such off-grid farms have 2 options to choose from; DC-powered fencers or solar-powered fencers. A DC-powered fencer system is a standard DC battery as both the power source as well as a store of electric energy. This means that the battery needs to be recharged first before being used to power an electric fence. Likewise, the duration that the battery can power the fence is determined by the total length of electric fence wire, with a longer wire length indicating a shorter battery life. Still, the efficiency of a DC-powered fencer system can be greatly improved by connecting it to a solar charger which ensures that the battery is charged during the day when there is sunlight while the solar energy directly powers the electric fence. During the night, the energy stored in the battery is used to power the electric fence. This type of fencer is called a solar-powered fencer system. Generally, solar-powered fencer systems are designed to be lightweight and portable, and hence can be moved around strip-grazing or rotational grazing systems. Two critical components of these systems are the solar panels and the rechargeable batteries. Usually, these batteries are lead-acid batteries whose average lifetime is 3 years, and they can store enough electric power, depending on their ampere-hour ratings, to power electric fence systems for 8 hours or more before requiring recharging. Still, it is advisable for one to have gel-cell solar batteries as backups. The efficacy of a solar-powered fencer system is determined by four main factors; overall fence length, number of electric wires in the fence, type of animal contained, and the impedance level. A long fence that has multiple electric wires requires one to install a heavy-duty solar fencer as compared to a short fence with a few electric wires. Also, large animals require lots of currents to be flowing through the wires as the lush hair and thick hides of such animals protect them from electrocution by low currents. The impedance of the solar fence charger is also important as it determines how much current flows through the wires, with low-impedance systems allowing more current to flow through the fence as compared to high-impedance systems. This is important because overgrown weeds that touch the lowest electric wire in the fence literally serve as grounding mechanism for the fence, which effectively reduces the amount of current flowing down the fence lines. For this reason, a low-impedance charger can generate enough current to power the entire electric fence despite the bottom-lying electric wires losing their power due to grounding via vegetations that are in direct contact with these wires. Still, the solar fence charger needs to be grounded properly using ground rods for it to function well as grounding completes the circuit. You may well already understand the benefits of owning a solar fence charger, that’s why you’re here in the first place; you wish to buy one. However, there may be elements of owning an electric fencer that you haven’t fully considered yet. Let’s take a look at some of the now. Your fence can be positioned wherever you need when powered by a solar fence charger. No need for annoying rigging to the grid. You can also move your charger to different paddocks with ease. It goes without saying that solar powered electric fences are environmentally friendly. Not a single fossil fuel, or nuclear rod has been used to generate that electricity. A fence charger powered by sunlight is immune to power outages and/or bad circuitry and battery failure. Your fence will remain live throughout. You may read the previous point and say, ‘ah, but what about when the sun doesn’t shine?’ The fact is, once fully charged, your solar charger should have enough battery life for two weeks’ continual use without the need of anymore sunshine. All of the above points make the solar fence charger an excellent choice for life off the grid. If that’s you, what other choice do you have for your electric fencer? You may also live on the grid, but the size of your farm makes connection in some places difficult. For distant fields where an electric fence is required and mains link not possible, the solar charger is once again your friend. Do you need to knock up an electric fence just for a few days? Maybe you and your stock are on the road. If so, temporary solutions are made easy with a solar charger. If you are worried your solar charger might go down, a backup battery can give you peace of mind. Have one charged and ready in the workshop and you will have your bases covered. A solar fence charger is absolutely free to run. Keep it well maintained and change the battery every 3 or 4 years and you will have a unit that will add nothing to your utility bill throughout its lifetime.